Eighteenth SS2011 Video Lookbook from Revery Media on Vimeo. Eighteenth explores the design possibilities of the beloved tee with a collection of shirts that are innovative, yet never over the top. The shirts combine unique detailing with a minimalist sensibility, and use bold geometric cutouts and asymmetrical lines to compliment their soft fabric and clean silhouettes. Eighteenth takes casual jersey tops and makes them fashionable and easy to wear with a variety of different outfit ideas. Have you noticed that bigger casual tops are in these days? No longer are tight tube tops the thing, it’s the loose off the top jersey shirt that all the celebs seem to be wearing. As most of you know, I am very small and my shoulders are extremely bony, so it’s hard for me to wear these jersey tops without looking like I’m wearing a shirt that is probably owned by my father or boyfriend and it’s two sizes too big. Eighteenthnyc sells sizes XS-Large, and XS is a perfect fit for my small frame. These tops can be worn with skinny jeans, regular jeans, leggings, shorts.. the possibilites are endless. I Love my Off Center V Neck in White. It’s extremely soft and 100% Rayon. It has a loose fit, (Sorry for the garage background) I wore these with a pair of skinny jeans and my boots. My last boot day because it’s March and it’s getting warm here in Arizona. But I will be wearing this top with a cute pair of shorts and tennis shoes. It’s a must have in any closet because it’s fashionable and basic. Now that I look at the pics taken for this post, I wish I would have dressed the outfit a bit more with some more jewelry. 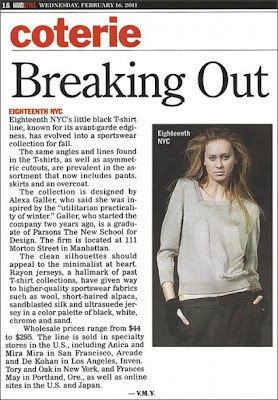 EighteenthNYC has been featured in Cosmo, Glamour, Lucky and many more magazines as the must have summer/spring top. Each top comes in many different colors and styles so make sure you check out their new Spring Collection on their website. This top is easily one of my favorites, and I’m sure I’ll get plenty of wear and tear out of the top. I will be posting more pictures of me wearing the shirt with different outfits, so stay tuned. Buy: You can purchase any of the above looks at Eighteenthnyc.com Be on the lookout for more ways to wear this casual jersey top here at Me & Bella.